What is a Cigar Bullet? 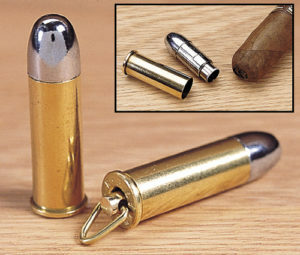 A cigar bullet is a type of cigar punch. It resembles a rifle/bullet casing. It’s used to cut a small hole in the head of the cigar. Some people prefer this instead of a cigar cutter which slices off a portion of the cigar head. There are a number of ways to cut a cigar without a cutter. Here is a short list. Here’s a video explaining the how to do the cuts and what the draws are like. It’s pretty interesting.